Attention Cheetah Olympians! All completed reading and math links for this summer's Cheetah Olympics must be turned in by Monday, September 19th. Prizes will be awarded at a celebration for all participants to be held the last week in September. If you have any questions, please email Annemarie Dumar at annemariedumar@gmail.com. A big thank you to all our volunteers who have helped our new kindergarteners learn the routines over the last two weeks - your support is really appreciated. Thank you also to everyone who joined us on Monday at our First HSA meeting of the year. It was great to see so many new faces. 1) Register your Price Chopper card to the school, our school code is 16358. Or you can send your details in to school and we can arrange registering your card to the school. 2) Use www.smile.amazon.com when making purchases on Amazon and register your account to Dorothy Nolan Home School Association, then 0.5% of qualifying purchase is donated to our HSA. 3) We are participating in the Hannafords Helps Schools program this Fall, from now through Dec 3rd. Please support us by depositing your school dollars in our slot in the collection bin, AND by encouraging all your friends and neighbours to as well! 4)(Campbell's) Label for Education program is ending. We will still collect all labels for the full calendar year. The Company is not printing them on products anymore so there should not be many incoming. But we would love to have all that are sitting in drawers, pantries or on items. 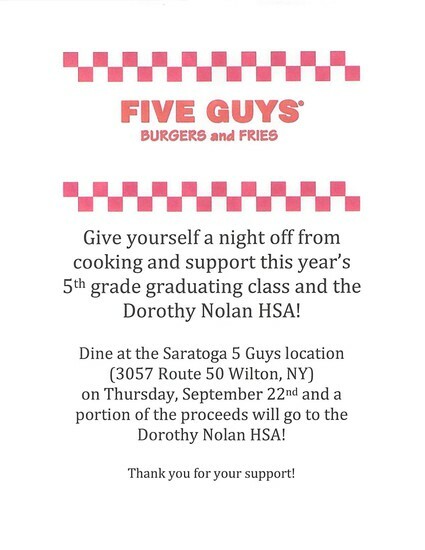 Help support the 5th grade graduation class and the Dorothy Nolan HSA on Thursday, Sept. 22nd from 4 PM-9 PM. See our flyer below. 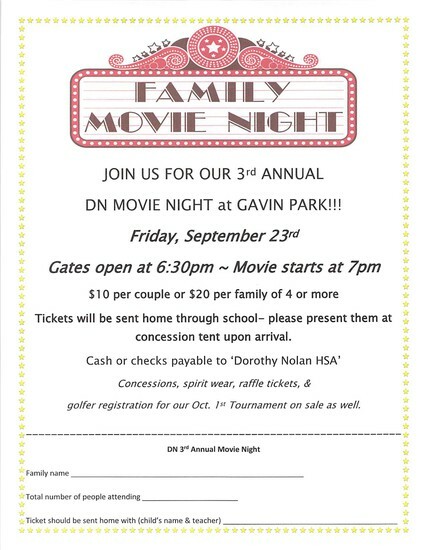 Our 3rd Annual Movie Night is on Friday 9/23 at Gavin Park. Gates open at 6:30 and movie starts at 7pm. We will happily accept donations for our concession stand (bagged chips, popcorn, water bottles, etc.) or a donation of your time to help set up. Volunteers are needed for a quick set up at 5:45, to work the concession stand from 6:30-7 (you won't miss the movie) and a few hands to help break things down at the end of the night. Don't forget to dress accordingly and bring a blanket/chair and flashlight. All children must be accompanied and supervised by an adult at all times...or we may need to call in Officer Hopps! 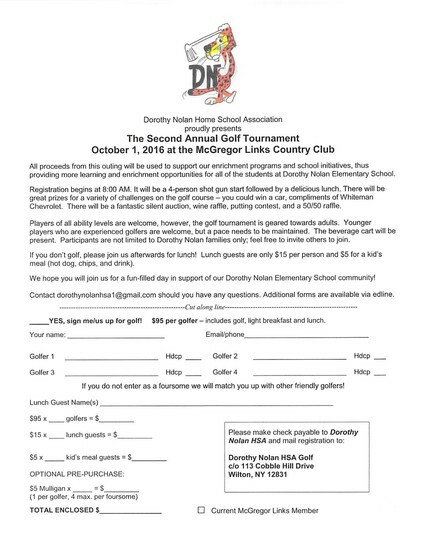 Please send your registration forms in by Tuesday, Sept. 20th. $5/person, $20/family of 4 or more. ​Please contact dorothynolanhsa1@gmail.com if you are able to help out. Our 1st Boxtops for Education contest is underway and ends on Friday, October 21st! Please remember to send your trimmed boxtops in a ziploc baggie labeled with the name of your child's teacher. Thank you to all our sponsors for the event! Hole-In-One Sponsor: Whiteman Chevrolet Inc. – win a new car!! Drink Cart Sponsor: Odd Networks, Inc. 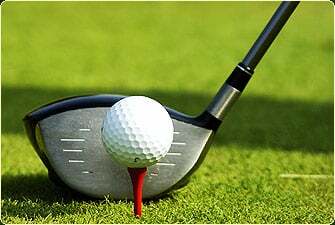 Lunch Sponsor: Superior Coach, Inc. and Scott Varley Group Inc.
We have amazing silent auction items to bid on at the tournament (or during lunch, if you are not a golfer). A few of the many donations include: gift cards to Dicks Sporting Goods, Jacob & Anthony’s, Saratoga Olive Oil Co., Upstate Transit of Saratoga LLC; tickets to a Tri-City ValleyCats game; basket of treats from Kilwins; overnight accommodations and breakfast at Pavilion Grand Hotel. Not Golfing? NO Problem :) Volunteers are needed! We need volunteers throughout the day of the golf tournament to make sure everything runs smoothly. Please consider helping us during as many sessions possible. SUNY Adirondack Continuing Education is offering online youth programming for 3rd-5th graders this fall. Courses include Cryptozoology and Forensics: Prove It. Classes run from September 26th to December 9th. For more information or to register visit conted@sunyacc.edu. The SNACpack Program is grateful for all those who helped pack and deliver over 800 bags of food over the summer months to our children in food insecure homes. Our program is continuing again as a weekly backpack that goes home on Fridays throughout the school year to students in all 6 elementary buildings, the middle and high schools. We welcome donations to be left in our front lobby of some staple items: mac & cheese, juice boxes and protein bars. We also welcome families to sign up to help pack each week at 4pm at St. Clement's Church, Lake Avenue, Saratoga. We ask families to sign up using our Sign Up Genius link. Thank you for all your support! Please arrive at 4:00 pm at St. Clement's Parish Center on Thursday night to help organize and pack the food. St. Clement's address: 231 Lake Ave, Saratoga Springs, NY If you are signing up as a family please sign up each person in the family for an individual slot. ex: 4 people= 4 slots THANK YOU !! !